Learning some common character components is essential for effective character learning. This is why Skritter provides character breakdowns where you can see what each part means and how it’s pronounced. Both these are useful for learning characters. However, some of them change form depending on which character we’re looking at and where in the character the component appears. In this article, we’re going to look at some common radicals and see how these change their form in different situations. Some of the changes are very minor and the characters would be recognisable even if written in their original form, but in other cases, the changes are so big that the alternate version(s) would be unrecognisable if you didn’t already know that they are the same character. Before we go into more detail about radicals, I’d like to say a few words about the terms used here. A radical is a character component that’s used to sort characters in dictionaries. They are often related to the meaning of the word. There are other types of character components, such as phonetic components that give a character its sound. The role of a certain component isn’t fixed, so it can vary between different characters. I use radicals here out of convenience more than anything else. As you can see, the changes are very minor indeed. 牛 has been compressed a bit and the bottom horizontal stroke has been tilted, but that’s it. The other characters have been changed to a similar extent. Some characters change quite a lot and if you don’t pay attention, you might think they are different characters. There are some cases which are even more confusing because it actually looks like a different character! Here are some common characters that undergo major or confusing changes, along with a brief explanation of each. 水 (water) is perhaps the first case students learn and it’s often written as three drops of water 氵 and is used in liquids like 酒 (alcohol) and things related to liquids such as being thirsty 渴. 心 (heart) has at least two alternate forms. The first 忄 is so common that you probably know it well after just a few weeks of studying. The second ⺗ is confusingly similar to 小, but note that it has an extra dot, giving it the same number of strokes as the original character. 火 (fire) has one alternate form 灬, which makes me think of something being put on a fire so that the flames are no longer roaring. It can help quite a bit thinking of this as fire rather than just four dots. 犬 (dog) is common in some animal names or words related to animals, and is written 犭, again very different from the original character. This is part of the character 狗 (dog), but note that 犬 can also be used to mean “dog”, but is more formal (read more here). 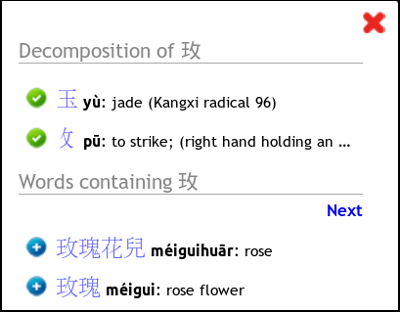 玉 (jade) is perhaps the most confusing radical of all, because as a radical it looks like 王 (king). Therefore, the radical that is written ⺩ does not mean “king” but is in fact 玉 (jade). It’s fairly common for Skritter users to ask about this, because you’d expect something like 玫瑰 (rose) to contain 王 (king), but this isn’t the case. As you can see, these cases require special attention, otherwise you might end up thinking that the character breakdown is incorrect or that a single character in two forms is actually two different characters. Of course, from a practical point of view, you still have to learn how to write both, but you should know that they are the same character. If you want to see alternate forms of all radicals, please check the article about Kangxi radicals on Wikipedia. If you want an edited list aimed towards character learning for beginners, check this article instead. If you have any suggestions or questions about this, leave a comment!